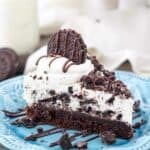 This Brownie Bottom Oreo Mousse Pie is a fudgy brownie topped with a mouthwatering white chocolate mousse loaded with crushed Oreos. This show-stopping dessert can be made in either a springform pan or as bars in a 9-inch baking pan. You had to guess this one was coming and if you didn’t, then I should tell you that I am obsessed with cookie mousse fillings. When you add the brownie on the bottom, it’s pretty much guaranteed to be good. 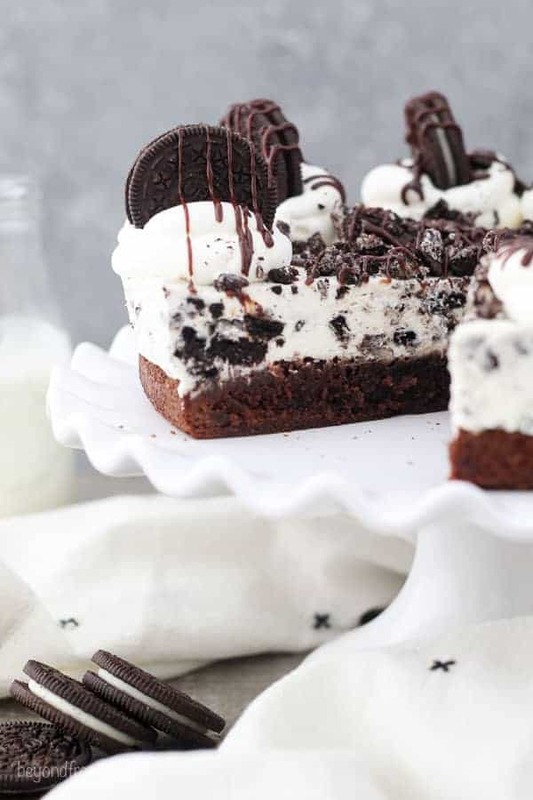 This Brownie Bottom Oreo Mousse Pie is a fudgy brownie base topped with a fluffy white chocolate mousse that is loaded with crushed Oreos. 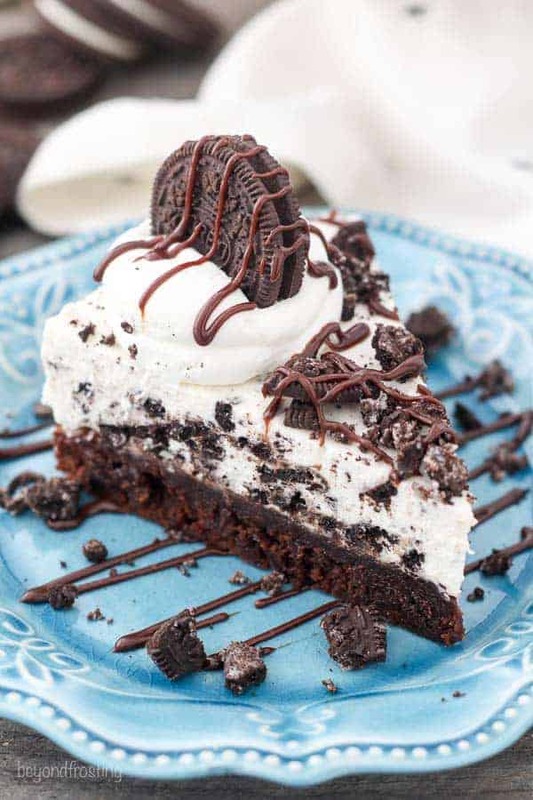 This is of course, topped with additional Oreos, whipped cream and hot fudge. 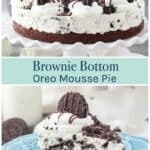 I have several variations of these brownie bottom desserts, and it’s usually happens when I make one that is SO good, I get flooded with ideas for more flavor combinations. 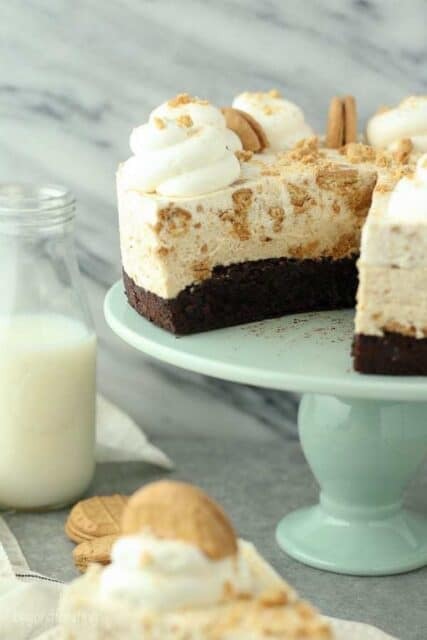 The brownie on the bottom makes this dessert sound so fancy, but really, it’s pretty easy to do! You don’t need anything special for the brownie layer, I usually grab a boxed brownie mix because it’s quick, but if you prefer a homemade version, you can do that as well. The brownie is baked in a 9-inch springform pan. It’s important that you have a secure seal on your pan, otherwise the brownie batter will leak in your oven. I also suggest lining the bottom of the pan with parchment paper, so your brownie layer doesn’t stick to the bottom of your pan. Once it’s baked and cooled, it’s time to make the mousse. I like the line the edges of my pan with cake collars (acetate sheets) which helps get that nice smooth edge. It’s not necessary, but it’s a nice touch. You can also use parchment paper, but it doesn’t peel away quite as nicely. You don’t have to line the edges of the pan with anything. In this case, just run the flat edge of a knife around the inside before you release the spring on your pan. Back to the Oreo mousse. This is made with a combination of melted white chocolate, a touch of cream cheese and homemade whipped cream. There is some gelatin in this recipe as well, but that helps give the mouse the light and fluffy texture we’re looking for. Let’s walk through the steps of making the Oreo Mousse. First melt the white chocolate in the microwave at 50%, which helps prevent the chocolate from burning. Then allow it to cool. Prepare your gelatin. In a small dish, combine 1 tablespoon of cold water and sprinkle 1 teaspoon of powdered gelatin over top. The gelatin with turn into a solid. Then you’ll melt that for about 10 seconds in the microwave, but watch it carefully because it bubbles up really fast! Next, prepare your whipped cream. I like to place my bowl in the freezer for a few minutes, so it gets nice and cold. Then pour your heavy whipping cream into the chilled bowl and beat it at a high speed until soft peaks for. Next, you’ll add the powdered sugar and melted geletin and continuing beating until stiff peaks form. Now set that side. Finally, you’ll beat your cream cheese until its free of lumps then add the melted white chocolate and beat it until smooth. Then you’ll fold the prepared whipped cream into the cream cheese mixture and mix until it’s smooth. Finally, we’re folding in those crushed Oreos and spreading the mousse over the cooled brownie. 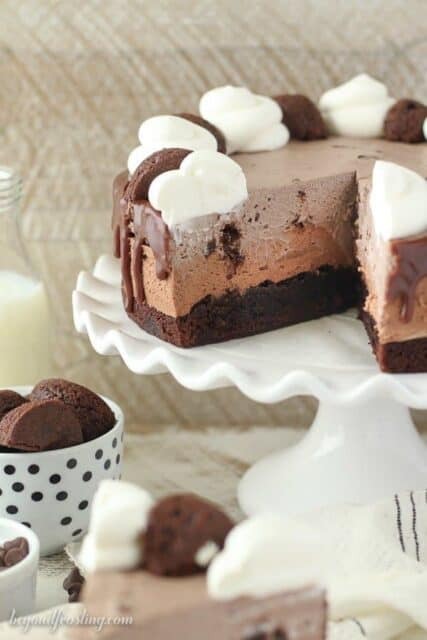 This Brownie Bottom Oreo Mouse Pie doesn’t really need a topping because it’s already SO good, but adding those toppings just give it the WOW factor it deserves. For the topping I added some additional crushed Oreos, tall swirls of whipped cream topped with yet another Oreo and drizzled with hot fudge sauce. I prefer to add the toppings just prior to serving so that I can remove the sides of the springform pan before I decorate it. 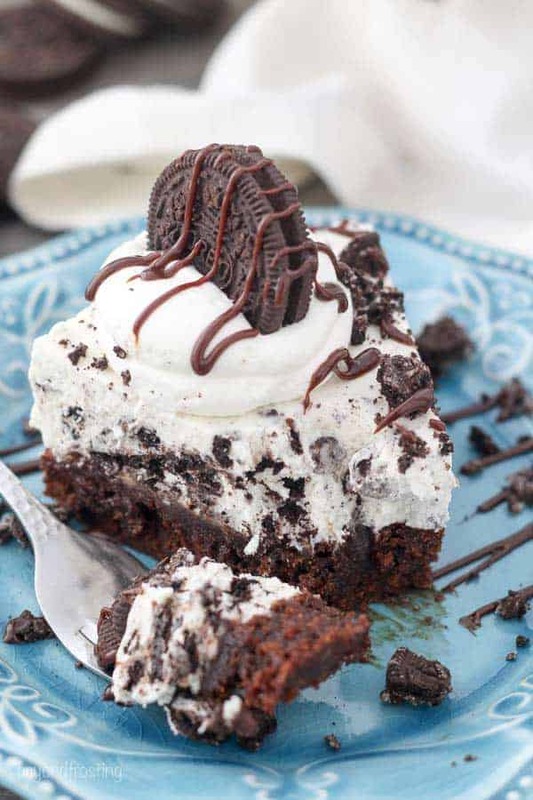 My dad is coming to visit in a couple weeks and I feel like he might be requesting this Brownie Bottom Oreo Mousse Pie. In a medium-sized bowl, combine the brownie mix, with the ingredients listed on the box. Stir until the batter is well combined and there are no dry ingredients left. Pour the batter into the springform pan and spread evenly. Bake at 350°F for 30-35 minutes until the center is baked but still slightly fudgy. Allow the brownie to cool completely. 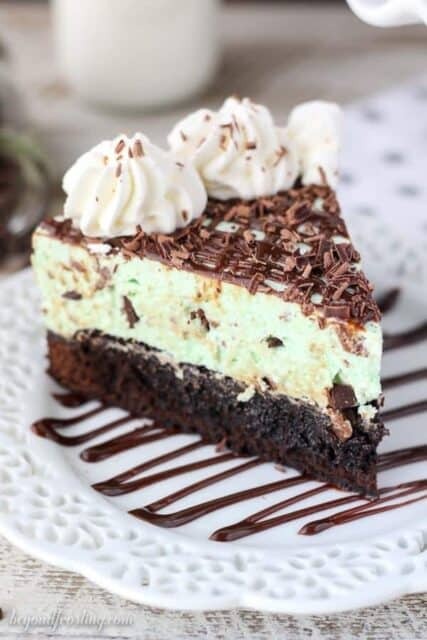 For the mousse: In a microwave-safe bowl, microwave the white chocolate at 50% power in 30 second increments until the chocolate is melted, stirring occasionally. Once melted, stir until smooth. Set aside to cool. Microwave the gelatin for 8-10 seconds until it turns back to a liquid, watch closely. To prepare the whipped cream, place the metal mixing bowl and whisk in the freezer for 5-10 minutes. Pour the heavy whipping cream into the chilled bowl and use an electric mixer to beat the heavy cream on medium-high speed until the cream starts to thicken. Slowly add the powdered sugar and liquid gelatin and continue beating on high speed until stiff peaks form. Set the whipped cream aside. Beat the softened cream cheese on medium-high speed for 2-3 minutes, until the cream cheese is free of lumps, scraping the bowl occasionally. Next, add the melted chocolate and mix thoroughly into the cream cheese mixture. Finally, fold the prepared whipped cream into the cream cheese and stir gently until the mixture is well combined. Fold in the crushed Oreos then spread the mousse over the cooled brownie (in the springform pan) and refrigerate for 3-4 hours. For the topping: Prepare a second batch of whipped cream as instructed above. Use a large pipping bag fitted with an open round tip to pipe 8 tall round peaks on the boarder. 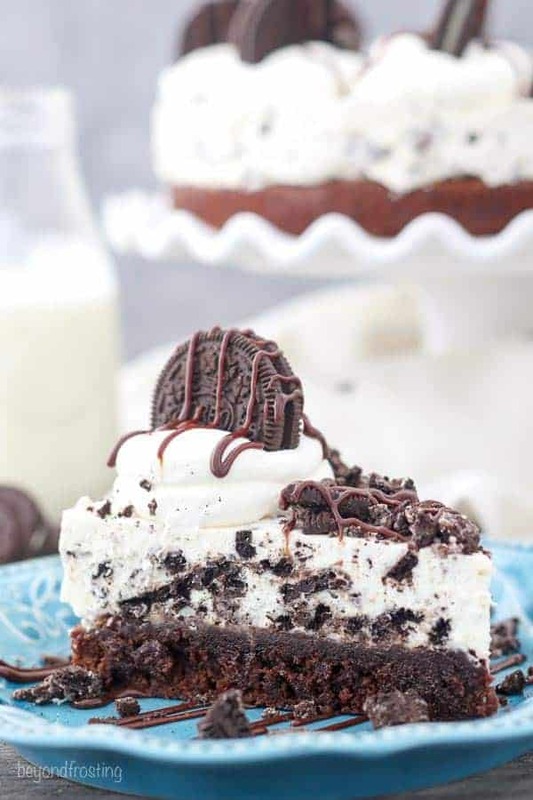 Top with a whole Oreo and drizzle with hot fudge. 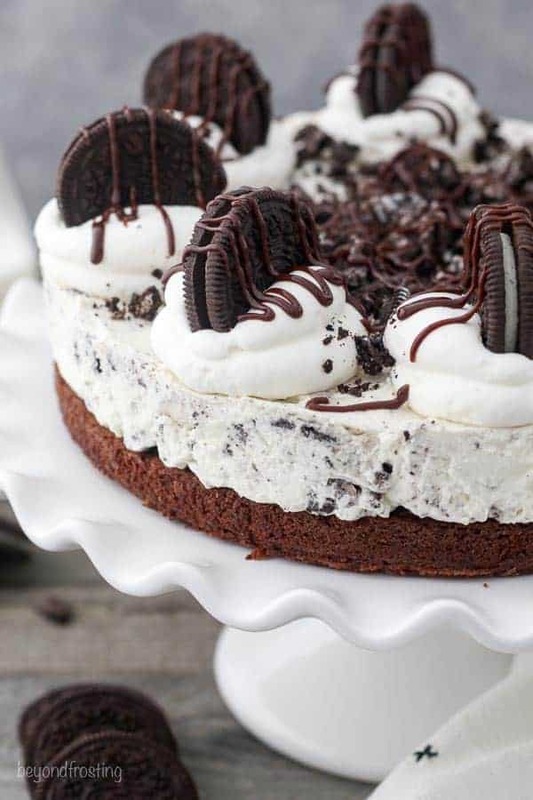 Sprinkle additional crushed Oreos in the middle. I read through the recipe twice but did not see when to add in the dissolved gelatin. Possibly when the powdered sugar to added to the whipping cream or, when the melted white chocolate is added to the cream cheese? This sounds like something I would like to make, soon. Hi Stephanie, thank you for pointing this out! It is actually added to the whipped cream. This should be updated now!